This course is designed for those who want an initial award for the role of teacher, tutor or trainer and, or are new to training and teaching and interested in developing a career in this area or for your own personal professional development. Have achieved or be working towards a level 2 Maths and English or equivalent qualification. A working knowledge of Information Communication Technology will be advantageous. Following completion of this course, having developed personal professional skills qualities and abilities in teaching, learning and training, you will qualify to teach in the Lifelong Learning Sector in Adult Education and may choose to teach in FE Colleges, Adult Community Learning Units, Trade Union Education Centres and, or be a trainer for a learning provider in Adult Education. Candidates who progress will be able to access higher education courses such as Contemporary Certificate in Education (CertEd Level 4) or Post Graduate Certificate in Education (PGCE Level 4). The cost of this qualification would normally be £680 however for a limited time only we can offer this qualification at a cost of £136 (paid by either trade union or employer). Candidates wishing to express interest. Please return this slip to Dave Hawkins Dave.Hawkins@wmc.ac.uk TUED 520 Cotton Exchange, Bixteth St, Liverpool, L3 9LQ. UNISON has been working with the Open University to develop a one day autism awareness workshop, bespoke for UNISON members. All members are welcome to apply using our regional application form which should be returned to UNISON branches. For further details and to receive a form please contact Tom at t.jenkins@unison.co.uk or phone 07817 121 628. My Learning Journey started 14 years ago. Having a husband and three sons also working part-time as a Mid Day Assistant at a Local Primary School I was very busy. I decided that I needed to gain relevant qualifications for a changed working environment. A friend told me Birkenhead Sixth Form Outreach College were holding computer courses in a local church. I signed up to join and went along to my first day full of anticipation. But, when I got there, nerves got the better of me and I nearly left without even entering the room the course was being held in. I gave myself a stiff talking too and went in. I know sometimes it takes a lot of courage to change your life, and try something new, but for me that day, it was the best decision I made for myself and not for anyone else. I went on to study CLAIT, IBT2,and ECDL in Computing. GCSE English and GCSE Mathematics. I studied for 3 years, after which I achieved a position in Wirral Libraries. This gave me further opportunities to study of which I also now run a weekly Get Into Reading Group for adults. Walking through that door at a local church was the start of a new journey that has enhanced my life. Being a Wife and Mother is life changing and rewarding, but gaining qualifications gave me confidence in myself as an individual. It was one of the best decisions I made and has had an amazing impact on my life. This is a 30 week course (day OR evening) run by the TUC for activists who have a minimum of 15 L2 credits or equivalent. It begins on October 6th in Liverpool at the Cotton Exchange building. Commences Thursday 7th of April 4-6pm until 19th May at Merseytravel learning suite at Mann Island, Liverpool. Professional stand-up comedian Sam Avery will teach you the skills to write and perform your own comedy routine AND perform in front of a live audience. Discover and pass on information about mental health. Meet new people in a friendly and non-judgmental setting. at Leasowe Learning Centre, run by the WEA. where internet access is becoming an essential human need. A great course funded by National Unison commencing in central Liverpool on Tuesday 19.04.16. from 1830 to 2100hrs for 10 weeks for Unison members. All out of pocket expenses will be covered and a weekend residential is included! We spend so much time thinking over stuff that has happened in the past, or worrying about things that may happen in the future, that often we actually forget to appreciate or enjoy the moment. Mindfulness is a way of bringing us back to experience life as it happens. Saturday 6th February 2016, 9.30-12.30pm. In partnership with the Manchester Deaf Centre, we are offering deaf awareness training sessions for our members in the North West. The date is Wednesday 6th April 2016. 10am – 1pm and 2pm – 5pm. Please specify your requested time on your application form. Application forms are available from Wirral UNISON Branch office. Please note that getting time off for courses can be difficult, you may need to apply for leave, or do it in your own time. 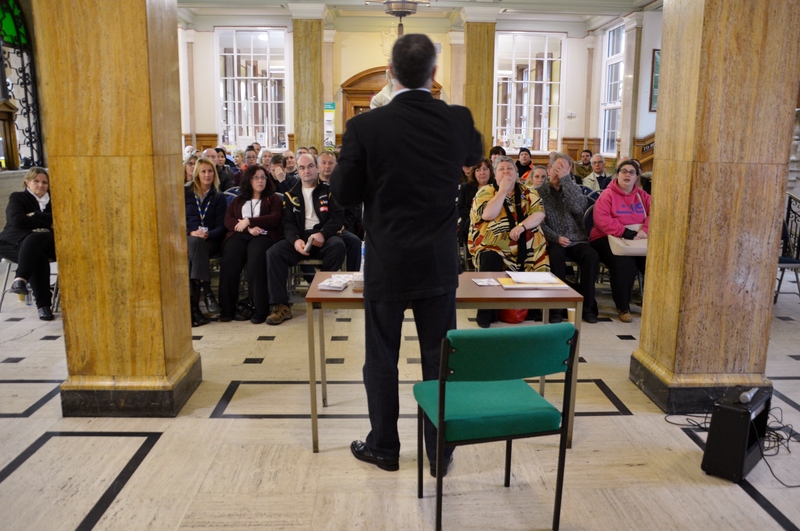 We held a launch event for the Reading Ahead Challenge, on 11/11/15 at Birkenhead library. 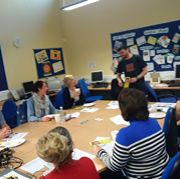 It was collaboration between UNISON, The Reading Agency and Wirral Libraries. Andy Mcnab gave a very inspirational talk, about his journey from a 17 year old, with a reading age of 9, to being a best-selling author. He is trekking to the South Pole next week to raise funds for the Reading Agency, a brilliant charity that works with UNISON, to promote literacy. Two UNISON members have agreed to be ULR's, which will help Wirral UNISON get more members involved in training and education. Huge thanks to Tom Jenkins, Learning Organiser, UNISON North West, and Martin Russo, National Learning and Development Officer, for all their help, and a special thanks to Paul Wiggins for taking the photographs for us. Anyone wanting to sign up for the Reading Ahead Challenge, please contact Diane Moore on dianemoore@wirral.gov.uk? 1. Maths and English courses up to Level 2 are free to all UNISON members and their families (aged 19+). These courses are run by Wirral Lifelong Learning in various locations on Wirral and run alongside school term dates. For enrolment please ring Julie on 630 3486. For further enquiries ring Dave on 07904727641. 3. Making the Most of the Internet - A one day Saturday course for members on 30 January 2016, from 9.30am to 4.30pm. This is a free course and lunch is included. The location will be Leasowe Adult Learning Centre (CH46 2QF). There are 12 places available. For expressions of interest please email hardcastledave2014@gmail.com. What does ULR stand for?